Many people find it difficult to sleep in the early hours before their wedding but few are at work analysing blood samples at 1am. Jon Hazeldine is so dedicated to his job that even on the day of his wedding he was at the Queen Elizabeth Hospital Birmingham testing specimens brought in by paramedics as part of a unique ‘Golden Hour’ study. The study, which began in May, is the first of its kind and is being conducted by staff from the National Institute for Health Research Surgical Reconstruction and Microbiology Research Centre (NIHR SRMRC). Jon, a 28 year old post-doctoral research fellow who lives in Great Barr, said: “In emergency medicine the ‘golden hour’ refers to a window of 60 minutes from the moment of critical injury in which prompt medical treatment is key to survival. “The NIHR SRMRC team has trained paramedics to take blood samples from trauma injury patients at the scene which are rushed back to our labs for immediate analysis, day and night. Jon met his wife Zoe, who works in insurance, at university. 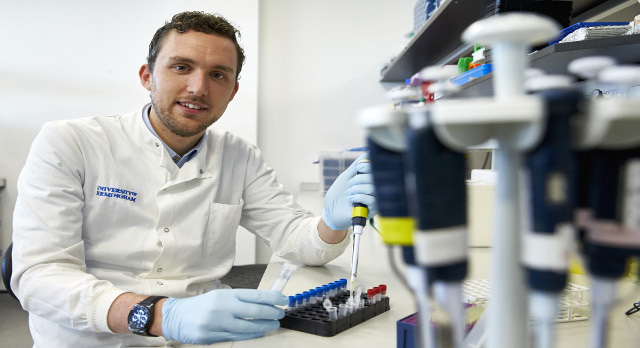 He studied human biology as an undergraduate and then did a Masters in immunology where he met Professor Janet Lord, who is leading the Golden Hour study. “Luckily Zoe is very understanding!” said Jon. “I love my job so am happy to come in at all hours of the day and night but I did manage to leave the ‘on-call’ phone with a colleague when we went on our honeymoon in Fuerteventura. The first sample arrives from the trauma scene within an hour and Jon gets to work analysing this before further samples arrive between four and 12 hours later. “Training paramedics to take samples in the first hour after injury has enabled us to ‘access’ patients at the trauma site and then a number of factors make what could be a very difficult project a lot easier,” added Jon. “Since April 2012, members of the team have worked in shifts and on call to provide a 24/7 trauma research nurse team, which operates 365 days a year. “They and neuro-trauma clinical research fellows Mr David Davies and Dr Zhangjie (Jack) Su ensure the organisation and communication is first class, making it easier to know when patients are recruited and when blood samples will be taken. The NIHR SRMRC Golden Hour study is being conducted in collaboration with the University of Birmingham, The Royal Centre for Defence Medicine and Defence Scientific and Technology Laboratories.